Led lighting is advancing all the time and at HR Cabling Ltd we can provide you with a comprehensive quote to show installation cost, energy saving and payback time. 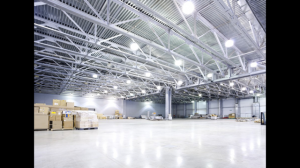 There are real savings to be made with the latest led lighting and lighting control systems. Commercial lighting is an area where massive savings are possible on your electricity bill. Pease contact us for details. Fibre optic cabling, terminating and splicing. that you may have or would like to discuss with us. HR Cabling are also providing customers with our ongoing services including LED lighting, electrical installations, TV installation, commercial and domestic lighting and complete network data cabling services. Network data cabling, fibre optic cabling and electrical installations. HR Cabling ltd are completing projects for a variety of clients, installing network data cabling, fibre optic cabling with single mode and multi mode use and electrical installations for all environments. We can now provide CCTV installation for home ,office and industrial unit. HR Cabling ltd are now able to provide full fibre optic cable installation, termination and testing with fibre patch panels for direct fitting into a communications cabinet on site. The fibre optic splicer will also join damaged cables if a re pull of fibre is not practical. The fluke DSX 5000 will provide detailed testing information. Please contact us for more information. HR Cabling ltd are now installing projectors for schools, offices and residential use. The projectors can connect to all input sources for visual display including laptop connection for meetings, school teaching aid and HD tv viewing. The installation can be upgraded to include speaker systems and drop down screens. Flat screen televisions can also be wall/ceiling mounted in your office and home. The complete installation process is completed by HR Cabling ltd including fixings, electrics and audio cabling. We can also provide network cabling to connect the projector and external sources to the internet. Please contact us for further details and quotations. HR Cabling Ltd are now approved ultimate installers in association with schnieder electric who are one of the largest maunfacturers and suppliers of all electrical and cabling accessories. The ultimate installer program allows HR Cabling Ltd to use the full range of Schneider accessories and assist our customers with a full design service for all electrical installations. Please contact us for more information. HR Cabling Ltd have recently installed warm white led tape light in a recessed overhead bulkhead with dramatic effect. The downlights are also led 8.5w fire rated and ip65 fully compliant with building regulations. The led tape light is also very low energy with long life. See our contact details for more information. 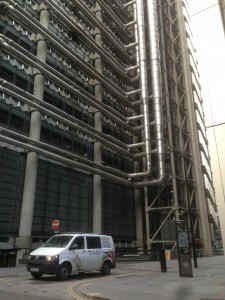 HR Cabling Ltd have recently completed a power and data floor box re-location in the iconic Lloyds building in London. 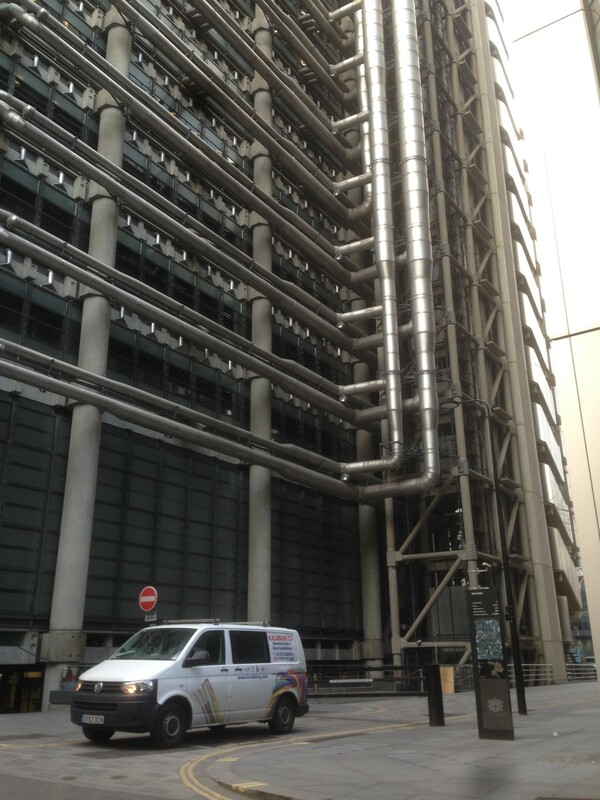 HR Cabling Ltd were asked to move floor boxes containing cat 6 cabling and mains power outlets to accommodate more desks on the 9th floor of the Lloyds building. HR Cabling ltd also had to install extra floor boxes on the 9th floor to allow for more staffing requirements. The project took place over two weekends and was completed on time and in budget. HRCabling ltd have recently installed 150 x LED downlights with a running load of 8.5watts per fitting but with the same output as a 50watt halogen downlight. The new LED downlight comes with a maunfacturers 7 year warranty and 70,000 hour lamp life. The led downlight is rated IP65 , dimmable and a 38deg or 60deg beam angle. 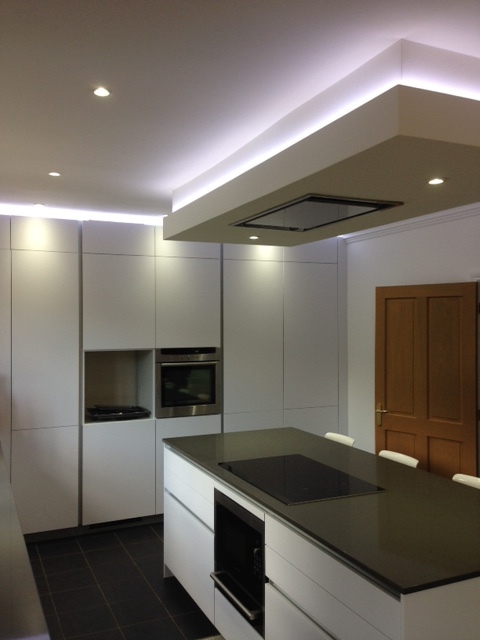 LED LIGHTING can save up to 80% on lighting running costs and is available in warm or neutral white. LED lighting can be installed to replace all existing forms of lighting. Contact HRCabling ltd for more information.